If you’re looking for a comforting pasta dish that won’t break your New Year’s diet resolution, you’re in luck! 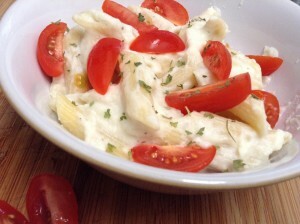 With this creamy, delicious, satisfying, (did I mention vegan?) pasta dish you won’t miss any heavy cream, butter, cheese or extra calories. This versatile sauce could probably pass as a cauliflower soup and can also be frozen and used for a quick weeknight dinner. Cauliflower is a good source of vitamin C, potassium, folate and fiber, giving you a boost in these cold weather months. The recipe is on Oh She Glows, I modified it by using Parmesan cheese instead of nutritional yeast and skim milk instead of the almond milk because that’s what I had in the fridge, but the vegan version should be just as delicious. Enjoy! Quick, think of your top 5 vegetables. Ok, now think of your top 10. Was cauliflower on either list? My guess is that for most people, cauliflower doesn’t make the cut, and it’s time to give it another chance. Cauliflower is a member of the cruciferous family of vegetables, which includes broccoli, Brussels sprouts, kale and cabbage. This family is known to contain cancer fighting compounds and studies have shown that eating a few cups of these vegetables per week may reduce the risk of certain cancers. Just one cup of cauliflower also has 90% of your vitamin C needs for the day as well as vitamin K, folate and fiber. It also comes in different colors – white, green, orange and even purple! Perfect for getting kids to try it. Roasted – Toss with olive oil, salt and pepper and roast in the oven at 425 until the edges are brown. Taste a piece and leave in longer if desired. Feel free to sprinkle a little parmesan cheese or your favorite herbs on top too. Mashed – For an excellent alternative to mashed potatoes check out this recipe for mashed cauliflower with green onions. 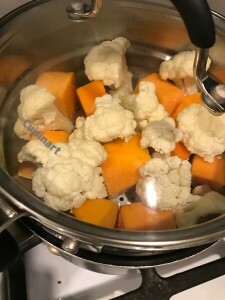 Puree – Another alternative to mashed potatoes – cauliflower puree. Substitute olive or canola oil instead of butter for a healthier option. Country Captain – this recipe is packed full of healthy spices and vegetables. 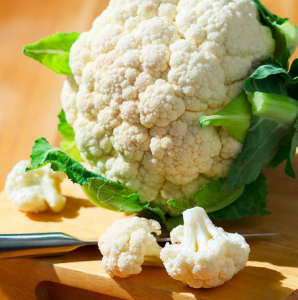 As a main dish or a side dish, it’s time to add a cauliflower recipe to your repertoire!